Looking for the ultimate city guide when you're headed stateside? Check out our complete NYC city guide with Schott NYC. One of the most exciting new brands to hit The Idle Man has to be Schott. They're one of the truly pioneering brands after being the first people to make a leather biker jacket, include a zipper on outerwear and become a true symbol of sub-cultured rebellion from the 1950s all the way through to the punk era of the 80s. After their birth in Lower Manhattan in two brothers' basement, they've gone on to dominate the outerwear market and were even commissioned as official uniform providers for the US military for a whopping 60 years. So, to celebrate their launch on The Idle Man and to get a look into the brand's roots, we hopped over the pond and took a guided tour of the Big Apple with this iconic and revolutionary label. Best Spot in NY to Grab a Coffee? La Colombe on Lafayette Street in Soho. Order the iced redeye, an espresso shot in iced coffee - it keeps us going all day! Best Diner for an all-American Diner? Bubby’s is our favorite all-American restaurant in New York City. It’s where we celebrate with our team and everything is locally sourced and made in-house, just the way we like it! Where Can we Find the Schott NYC Team after Work on a Friday Evening? 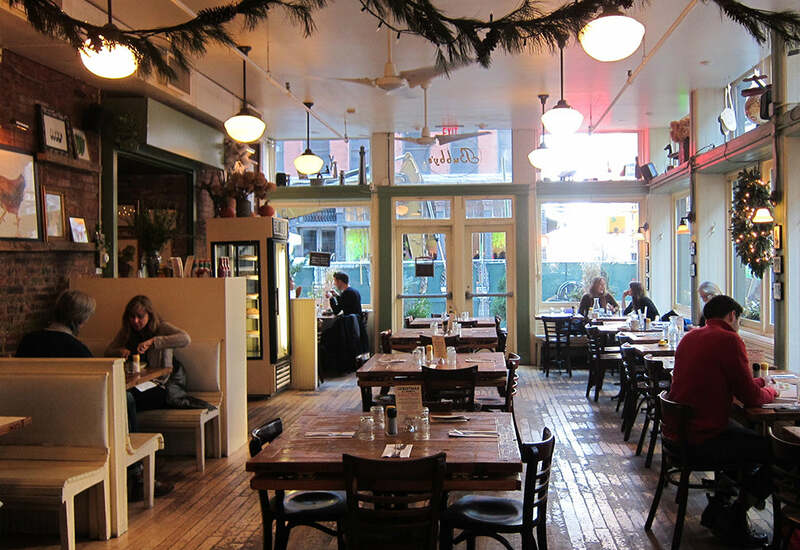 Botanica Bar on East Houston Street is just around the corner from our store. There is no cell service so it’s great to unplug. They have the best happy hour deals and it’s right above the subway so you can stumble out of the bar and right on to the train. Where Would You go to Grab a Bit of Inspiration? People watching on any stoop in NYC but we are partial to the iron American Flag bench in front of our store on Elizabeth Street in Nolita. Hidden Gem to Escape from the Madness of the City? The best way to appreciate the madness of the city is to observe it from above at a roof deck bar. For a different perspective of the city, take the tram to Roosevelt Island to see our incredible skyline from the outside. Where Should we Head to say Hi to the Schott Team? 236 Elizabeth Street. Our Nolita store is our home away from home. If our family isn’t working, we’re hanging out there. Where does the Magic Happen at Schott NYC HQ? At our factory in Union, New Jersey. It is where we still make our jackets on turn of the century machines using traditional techniques, and is the center of operations for the company. The First Place You'd Take a Foreigner to Show them the Real NYC? There are still pockets of real New York City everywhere if you explore but the Lower East Side still has the charm and history that made us who we are. What's the Earliest Memory of NYC? NYC is much safer now than it used to be but back in the day there was a real edge to it. There was a level of excitement even as a kid but you could never let your guard down. Punk rockers everywhere and a level of dirt and grime that we look back on through our rose coloured glasses with nostalgia. What part of NYC best Represents the Schott brand? Irving Schott started making and selling jackets in the Lower East Side and is the birthplace of the family business. Our brand became ingrained in American culture forever through the East Village music scene that brought the world rock and roll and punk music.